ALE has used its TLG1000 hydraulic gantry system to perform high capacity lifts during the installation of an elevated viaduct in Argentina. 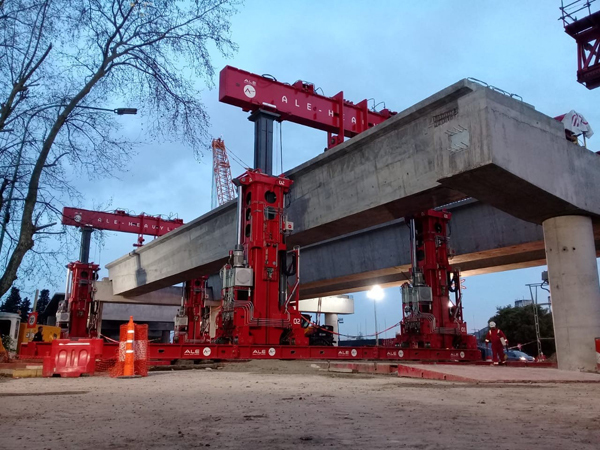 The heavy lift specialist was tasked with installing 538 concrete girders, weighing 230t each, over the San Martin railway in Buenos Aires. A launcher is being used to install 534 of the girders. However, the space between two of the piles is larger than the typical spans the girder launcher can reach, so ALE had to find an alternative lifting method. As a result, The TLG1000 was used for four of the girders. One of the other challenges was that an underground gas pipe was located beneath. ALE needed to find a lifting solution that avoided this. Despite a high capacity crawler crane being the easiest option to install the girder sections, it was not feasible to lift because of the high ground bearing pressures that risked breaking the pipeline. The optimum solution was the TLG1000 gantry system which can spread the load better and more evenly to overcome this. The TLG1000’s monitoring systems also provided data on ground settlement, to give the client assurance that this did not impact on the gas pipe underground. The new viaduct, measuring over 5km long, is located over the San Martin railway line, connecting the Palermo to La Paternal neighbourhoods of Buenos Aires. ALE has 480 girder sections left to install and is expected to complete in April 2019.